Tamms is a village in Alexander County, Illinois, United States. The population was 1,043 at the 2010 census. It is part of the Cape Girardeau–Jackson, MO-IL Metropolitan Statistical Area. Tamms was established under the name of Idlewild in 1883. Tamms is the location of the Tamms Correctional Center, a super-maximum correctional facility that was operated by the Illinois Department of Corrections and housed the State of Illinois execution chamber. 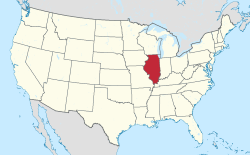 Illinois abolished the death penalty in 2011. This prison was closed in 2013. Tamms is located at 37°14′25″N 89°15′53″W﻿ / ﻿37.24028°N 89.26472°W﻿ / 37.24028; -89.26472 (37.240207, -89.264822). According to the 2010 census, Tamms has a total area of 2.33 square miles (6.03 km2), all land. As of the census of 2000, there were 724 people, 279 households, and 191 families residing in the village. The population density was 309.4 people per square mile (119.5/km²). There were 316 housing units at an average density of 135.1 per square mile (52.1/km²). The racial makeup of the village was 74.72% White, 23.62% African American, 0.14% Native American, 0.14% Asian, 0.14% from other races, and 1.24% from two or more races. Hispanic or Latino of any race were 1.66% of the population. There were 279 households out of which 33.7% had children under the age of 18 living with them, 46.2% were married couples living together, 19.0% had a female householder with no husband present, and 31.2% were non-families. 30.5% of all households were made up of individuals and 17.2% had someone living alone who was 65 years of age or older. The average household size was 2.49 and the average family size was 3.10. In the village, the population was spread out with 29.3% under the age of 18, 6.9% from 18 to 24, 23.9% from 25 to 44, 20.4% from 45 to 64, and 19.5% who were 65 years of age or older. The median age was 38 years. For every 100 females there were 84.2 males. For every 100 females age 18 and over, there were 80.3 males. The median income for a household in the village was $19,511, and the median income for a family was $28,214. Males had a median income of $32,500 versus $17,500 for females. The per capita income for the village was $11,131. About 24.7% of families and 30.8% of the population were below the poverty line, including 42.1% of those under age 18 and 16.8% of those age 65 or over. Tamms was the location of the former Tamms Correctional Center, a super-maximum correctional facility operated by the Illinois Department of Corrections which was closed in January 2013. The State of Illinois execution chamber was at Tamms. Prior to the January 11, 2003 commutation of death row sentences, male death row inmates were housed in Tamms, Menard, and Pontiac correctional centers. After that date, only Pontiac continued to host the male death row. The death penalty was abolished in Illinois in March 2011. ^ "Geographic Identifiers: 2010 Demographic Profile Data (G001): Tamms village, Illinois (with revision R15966)". U.S. Census Bureau, American Factfinder. Retrieved May 8, 2013. ^ "Tamms village, Illinois Archived 2011-06-08 at the Wayback Machine." U.S. Census Bureau. Retrieved on August 15, 2010. ^ "Tamms Correctional Center." Illinois Department of Corrections. Retrieved on September 1, 2010. ^ "Tamms Closed Maximum Security Unit: Ten-Point Plan Brief." Illinois Department of Corrections. 3 (9/51). September 3, 2009. Retrieved on September 1, 2010. This page was last edited on 12 June 2018, at 20:48 (UTC).